In the earlier chapters, I identified the power and pervasiveness of geological processes along the seashore and riverbanks, where their effects are obvious. In this chapter I will show that similar although less evident processes are active in the uplands, breaking stones, churning sediments, and moving earth downslope. These processes are active at many levels of intensity and frequency as they mold the form and content of what geologists call unconsolidated surficial deposits. Because of this multiplicity of levels these processes strongly influence the distribution and abundance of plants. Now I shift to what are recent events on a geological time scale that, however remote they are to us, still influence plant distributions. Continental ice sheets left the mark of their heavy hand on the landscape of the northeastern United States and Canada. The ice polished rock surfaces on the shoulders of hills and scoured out valleys, cutting off the lower reaches of tributaries. Like a giant bulldozer it pushed cubic miles of surficial unconsolidated material out of northern uplands to the edges of the low-lands. The ice left morainic tills and outwash at its edges and piled up the fishing banks from Newfoundland to Cape Cod. It seems impossible to exaggerate the extent and importance of the ice's impact, but its very existence has been acknowledged for barely twice my lifetime. Ice alters topography by gouging out preglacial valleys. It grinds hard against the sides and bottoms of valleys, plucks angular rock fragments off bedrock, fixes them in its grasp, and uses them as tools to grind other outcrops as it moves over them. Matthes described ice scour on the granitic mountains of Yosemite National Park (1950). Similar effects, on a less grand scale, are evident in Acadia National Park in Maine. Massive granite is resistant and ice moves upslope over it, polishing the upslope surfaces. On the lee side, the ice freezes onto exposed blocks and carries them away. Hence, granitic mountains show spectacular, angular cliff faces and rounded domes. More friable bedrock (metamorphic and sedimentary rocks) is shattered by frost action. The frost rives peaks and ridges that stand out above the ice and heaves the rubble downslope. The riving of broken rocks carves jagged peaks and sharp ridges. Mountains of such friable materials show isolated jagged peaks and great sweeping lines of broken rock on convex slopes. The rapid erosion of exposed peaks and ridges reinforces the tendency of mountain tops in glaciated regions to be at similar levels. The ice under the glacier presses heavily as it moves, deepening and altering valleys from V-shaped (convex slopes) to U-shaped (concave) with sheer valley sides. Rock debris left by the ice or the streams flowing off it is known as drift. The great bulk of the drift was removed from northern uplands and pushed to the exposed coastal shelf between the ice and the deep sea. Ice came and went many times, and traces of different ice sheets are evident as loose, younger till and weathered-compacted older tills. Some remnants were plastered on valley sides and in valley bottoms under the ice. These are ground moraines. Some were moved to the edges of the ice where the ice stood temporarily. These make up lateral and end moraines. Glacial deposits tell you how they were formed, more than what they were beforehand. Till, the muddled mixture of coarse stones, sand, and stuff as fine as clay, is a major component of glacial deposits. Compacted tills packed into lower slopes are usually partially covered by material that slumped off the valley sides, creating the gentle "run-out" of lower slopes in glaciated topography. The ice may override debris, pushing up rounded, elongate hills that look like overturned boats, called drumlins. Drumlin fields are scattered along the coasts of Nova Scotia, around Boston, and in Wisconsin, where preglacial topography apparently jarred the flow of ice. Other topographic signs of glacial landscape include undulating topography of round hills and closed valleys, small lakes, and sand ridges. The landscapes along the glacial border from Minnesota and Iowa to Pennsylvania and Long Island are barely subdued versions of those in the north, where the ice is today a few miles away. Moraines left by earlier advances are muted, as frost heaving and slump have moved materials off the ridges into low places. The prairie potholes, west and southwest of the Great Lakes, are examples of ground moraines. The low rolling hills are pockmarked with undrained hollows. Where underlaid by tills, the hollows have "perched" water tables, making for multitudes of lakes, ponds, and marshes. Rainwater percolates through lenses and sheets of sand extending for miles under the till, and it emerges as artesian springs that maintain the water table in the lakes and marshes. These ephemeral wetlands make highgrade nesting grounds for waterfowl and waders. One pothole may attract half a dozen species of nesting ducks and several sandpipers. When the last ice melted away from the coast twelve thousand to thirteen thousand years ago, the land was still pressed down by the weight of the ice, and the ocean flooded far up the hillsides and into New England valleys. Breaking waves built cobble beaches two hundred feet above the present sea level on granite ridges on Mount Desert Island and along glacial moraines fifteen miles from the sea farther east. At this time, rivers flowed turbid with clay and silt, which settled out, plastering much of midcoast Maine with marine clays containing the shells of blue mussels and Arctic species of clams. As the coast rebounded, the sea retreated, but it still fills the lower reaches of preglacial valleys. The rocky ridges separating valleys are now peninsulas and the hilltops are islands. Frost heaving in the ground around the margins of the ice sheets churned the upper levels of the soil, eliminating the orderly zones of leached and deposited minerals that we associate with soil profiles. British farmers noticed this and called it the warp. New England soils show evidence of churning associated with the intense frost activity. Indeed, frost action created many of the fine-grained topographic features on New England uplands. Most people are unaware of these features' existence, let alone of their pervasive influence on the distribution of trees. The vegetation of the mountains responds to the effects of solifluction, or frost-moved rubble, and vertical movement of fines on patterned ground, because of the effects the soil structures have on the distribution of moisture. Once your eye is trained to see these responses you begin to see similar ones lower down. The forest trees there also respond to the effects the soil structures have on the distribution of moisture. The shape and size of a small valley reflects the importance of the size of a drainage basin. First-order streams occupy much smaller drainage basins than do second- or higher-order streams. The importance lies in the frequency of intense, localized downpours of rain in the hills. A single heavy rainstorm may drench the entire drainage basin. Such downpours, like spring freshets that follow a sudden thaw, produce spectacular local floods. The effective forces carving valley forms are periodic downpours, landslides, and floods—all rare events of unusual intensity. Between downpours, fallen trees, branches, and leaf litter collect on slopes and in channelways. Long-term studies of a forest stand in the drainage basin of a small headwater stream, Hubbard's Brook in the White Mountain National Forest in New Hampshire, have clarified what is happening in the physiology of the forest (Bormann and Likens 1979). Teams of botanists and chemists followed the chemical interactions between the trees, the litter, the soil organisms, and the mineral soil. For decades, organic materials and mineral nutrients cycle between organic debris in the soil and the wood in trees. Leaf and branch litter collects in valley bottoms and may block the stream channel. High winds add branches and occasionally whole trees to the debris on the forest floor. Following fires or cutting, the trees grow back and production of organic matter exceeds respiration for many years. Then botanical processes slow as the canopy is closed. Although, for short-lived botanists, the forest seems to be "at equilibrium," sooner or later geological time takes over. A downpour carried on especially high winds knocks the forest down and the floods move the debris out of the creek beds. During these special events sediments start their travels to the sea. John Hack, a geomorphologist, and John Goodlett, a forest ecologist, worked together in the headwaters of the Shenandoah Valley, in the heart of the Appalachians, in the 1950s (Hack and Goodlett 1960). Hack and Goodlett's study was inspired by one such spectacular flood on the Little River in Virginia. They found massive new gravel and sand deposits all up and down the river, both in the alluvium and in tongues of debris on the valley sides. The landslides of surficial debris loosened from valley sides and left scars of exposed mineral soil. Equally important, they found conspicuous evidence of previous landslides. By dating the trees on the old debris fans, they showed that major slides had occurred well before the arrival of European colonists. Hack found several generations of debris slides extending back several hundred years, and Goodlett found several species of forest tree, such as scarlet oak, to be closely associated with the coarse soils at the tips of these "fossilized" avalanche tracks. The chutes created by landslides, twenty to one hundred feet across, were most numerous in the hollows at the heads of valleys over outcrops of Hampshire shale and sandstone, a weak rock. The landslides began just below ridge crests, under outcrops of Pocono sandstone, a resistant rock. The evident relation between landslides and vegetation had confused earlier foresters who interpreted the correlation as reflecting the effects of logging in the late nineteenth century. It was logical within classical American ecological theory to consider the second growth, which grew up following the logging, to be immature. To attribute the flood damage to the "inferiority" of the vegetation carries the implication that stable mature vegetation would have prevented it. But Hack and Goodlett pointed to debris from many landslides older than the logging that had been colonized by the same species that grow on the recent debris fans. The debris from the older landslides showed that the suggestion that an undisturbed forest can protect the soil from landslides leads to a contradiction. The two researchers observed that "compound debris fans are unequivocal evidence of flood damage to slopes in the past, prior to the period of logging and probably prior to the time of settlement by the white man. Either the forests mantling the slopes in the past were not all 'thrifty normal stands'—a possibility—or the slope forests, regardless of quality, cannot control huge volumes of runoff" (1960). Furthermore, if the vegetation is developing toward a regional norm, then progressively older landslides should be vegetated by species closer to the regional norm. But Goodlett found the species on the oldest landslides to be the same as among the seedlings on the newest slides. Hack and Goodlett found the distribution of forest trees to correspond closely to topographic divisions and contemporary geological processes. Goodlett found that altitude, exposure of the slopes, soil moisture, and kind of bedrock strongly influence the distribution of forest trees. He found that species distributions correlated best with features that affected the availability of water through the season. Details of local conditions were especially important. He found that the moisture-loving and fibrous-rooted yellow birch grew on rubbles along streams and on block fields where snow and ice persist, and that the drought-tolerant tap-rooted oaks may be excluded from the hollows by frost heaving. The continental ice reached the central uplands in Pennsylvania. Goodlett surveyed the forests on residual soils beyond the glaciated area and on the drift within the glacial boundary to see what might be the effects of differences in history (1954). You would expect, a priori, to find stark differences. South of the reach of the ice, you would expect deep residual soils, developed in situ during long periods of chemical weathering. In contrast, where the ice had reached, you would expect the soil to have been scraped off ridge tops, leaving blocky deposits in pockets behind rock shoulders and on valley bottoms. As he expected, Goodlett found thin till on the hilltops and long, smooth, boulder-strewn slopes in the glaciated areas. But instead of the expected marked differences between the glaciated and residual soils, he found a thin, disturbed, and structureless soil spread over the entire landscape, under the current organic layer. The structureless layer included fine-grained material studded with large pebbles, boulders, and fragments and a large amount of fine sand and silt, which appeared as if wind-blown. Many of the large rock fragments were rounded and derived from the underlying bedrock, while others were angular, derived from bedrock further upslope. Goodlett found no differences in the tree species composition over a wide range of topography on the two sides of the border, but he did find important differences in species according to present climate, topography, and soil structure. While the general vertical distribution of forests reflects climate, local differences reflect the composition of surficial deposits, especially the abundance of rock fragments that affect the depth to the water table. In her important book on the forests of the Appalachians, Lucy Braun suggested that the oak-chestnut forests occur on younger surfaces of the Appalachians because the soils on those surfaces are too young to allow the full development of the climax mixed mesophytic forest (1950). Extending the logic to the south, she believed that the mixed mesophytic forests persisted since the Tertiary on undisturbed soils on the highlands of the Cumberland Plateau. Extending the logic to the north, she suggested that the forests within the region of the Wisconsin Drift are immature because the soils have had less than ten thousand years to mature since the retreat of the last ice. Cooper's studies in Glacier Bay, Alaska (where glaciers have been retreating rapidly during the last one hundred years), are used to illustrate the principle that pioneer mat plants and then shrubs such as willows and nitrogen-fixing alders are required to prepare raw soils for colonization by trees (1923). The principle is weakened if trees colonize raw mineral soil on glacial moraines within a few years of being uncovered by glacial ice. Sigafoos and Hendricks examined the time intervals between stabilization of alpine glacial deposits and establishment of tree seedlings at Mount Rainier, Washington. By counting tree rings, they found that "where tree ages were compared with known ages of recently deposited moraines...the interval between sediment stabilization and tree seed germination is estimated to be 5 years for bottomlands" (1969). Why then is it so far from the ice tongues in Glacier Bay to the forests far down the valley? That is still a good question, but perhaps local winds and frost action discourage establishment farther up the valleys. Sigafoos and Hendricks found that "dating of a recently deposited pumice layer and determining the ages of trees growing on an underlying moraine near timberline show that the interval is longer at high altitudes than at lower altitudes" (1969). Moreover, M. B. Davis reported that in the postglacial sequence of vegetation reported from pollen analysis of deposits in peat bogs, "an interesting aspect of the migration of spruce is that everywhere spruce preceded alder (Alnus), the pollen of which peaked after spruce began to decline....This is somewhat surprising, given the well-known primary succession sequence at Glacier Bay, where nitrogen fixation by alder is important in allowing spruce to grow" (1980). I doubt that an orderly succession involving alders played an important role in the establishment of a white spruce forest sixty to seventy feet tall perched on two feet of morainic debris over green-blue glacial ice that I found on the Matanuska Glacier, north of Anchorage, Alaska. I found no alders in the understory. Field studies have shown that the seedlings of many trees survive best on mineral soil. The young do not need a mature soil to become established, and they create a new profile faster than they were given credit for. Olson reexamined chronological details of soil development in the Indiana sand dunes studied by Cowles (Olson 1958). He reported: "Soil analyses of carbon, nitrogen, moisture equivalent, carbonates, acidity, and cation exchange relations show how most soil improvement of the original barren dune sand occurs within about a thousand years after stabilization. The pattern of change on older dunes promises little further improvement and perhaps even deterioration of fertility" (1958). According to this, 12,500 years is more than enough time for vegetation to create a soil profile. In the morainic topography along the coast of Maine, many kettle holes and depressions have been taken over by bogs. The bogs are typically domed, their tops determined by the height to which dead stems, leaves, and Sphagnum peat can lift water by capillary action. The capillary action must be especially effective toward the middle of the bog for the bog to be domed. In many bogs, low places toward the center "degenerate" into wet meadows and ponds that form a concentric pattern around the dome. It would seem that the hydraulic processes exceed the botanical and that water drowns places on the top of the dome. Under such circumstances, it is imprudent to consider these bogs to be temporary stages of vegetational development in ancestral ponds, being filled with organic debris and destined to be overgrown by forest. Plate 3. Bylot Island, Northwest Territories, Canada. The distinct ridges in front of the tents were formed by frost action. Photo by the author. Not surprisingly, the clearest correlations between vegetation and glacial deposits are found where glacial topography is best defined. One such place is the ground moraine of the prairie potholes from Nebraska and Iowa through Minnesota, the Dakotas into Manitoba and Saskatchewan. The rain stands in the depressions, underlaid by compacted tills while it quickly drains away from the rounded sand hills. The topography and soil conditions have clear and dominant influence, and they differ over short distances. The depressions are occupied by aquatic plants while the higher ground is occupied by grasslands. The borders are sharp between the aquatic vegetation and grasslands. It appears to be more than coincidence that Clements gained values-forming experience about consistency and naturalness of plant associations in these places. During most of the twentieth century, academics have considered the typical habitat of white pines to be a place in the succession of old fields, but the pine was abundant and it called a different place home long before the white settlers came. Most of the pines grew on outwash plains left by rivers flowing off the stagnating glaciers. Nearly pure stands covered the extensive sand plains of southern New Hampshire and central and eastern Maine. I shall discuss the importance of the growth patterns of white pines in chapter 7. In this chapter I have focused on geological processes in surficial materials on hill slopes. Even though the movements of material may not be demonstrable in the short attention span of a human, they have effects on the growth of trees on slopes and they leave patterns in coarse and fine-grained materials that favor some species here and others there. While chance is uppermost, much of the variance in local distribution of forest trees is explainable in terms of the complex of soil texture, soil moisture, and topographic exposure that foresters refer to as site. This is the botanical equivalent of zoologists' "niche." Appreciation of these concepts shifts attention away from equilibrium communities as the units of study to questions about the distribution of individual species, alternative combinations of species, and how plant associations (and the concept of plant associations) vary from place to place. The consistency we see in plant associations must be influenced by our ability to "keep track" of a number of species at the same time. As long as people restrict their experience to a small region (the experience of a local naturalist) they can keep in mind a list of species associations that are consistent within their home range. While I was pursuing the study of plant communities, I found I could pick out patches that matched what I had in mind, but when I looked closely and kept track, I realized I was steadily expanding the list of infrequent species. Gleason and later Preston realized that a small number of species are abundant in most samples of vegetation (Gleason 1926; Preston 1962); a few more occur in small numbers in most samples; but most species are infrequent and scattered, in fact relatively "rare." Gleason described this frequency distribution as an exponential decay curve. This leads to the question: how are variations in species associations distributed over major geographic areas? My strong impression is that the recognition of consistent plant communities is largely limited to mid latitudes. The phenomenon results from a regression of highly variable local plant lists against a nearly constant range of variation in microtopography, exposures, and soils. Differences in microtopography, and so on exist almost independent of latitude and position on continents, but local climates vary widely according to latitude and local conditions and have dramatic effects on the richness of the flora. Places with "moderate"—warm and moist—climates are relatively rich in species, while those with marked swings in environmental conditions support only a few. The coniferous forests consist of a small number of species relative to the number of species found in warm temperate forests or the tropics, but a large number of species relative to tundra regions. "Plant associations" are woven out of shifting combinations of these species, certain combinations occurring repeatedly because the species are common and wide-spread. Beyond that, chance plays a central role. When the number of species present matches the topographic diversity, an observant naturalist can match consistent clusters of species to recognizable habitats. We should not be surprised that the concept of communities developed where the number of species is "not too small, not too large, but just right," as Goldilocks might have said, to match local microtopography. This happy coincidence exists where there are moderate floras (in central and western Europe and the eastern Great Plains of the United States). It just happens that in these locations schools of plant sociology developed, closely associated with major midwestern universities. In contrast, botanists who have worked either in the north or in the tropics have been less sanguine about community concepts. Bormann, F. H., and G. E. Likens. 1979. Pattern and Process in a Forested Ecosystem. New York: Springer-Verlag. Braun, L. 1950. Deciduous Forests of Eastern North America. Philadelphia: Blakiston. Cooper, W. S. 1923. The Recent Ecological History of Glacier Bay, Alaska. Parts I, II, and III. Ecology 4 (2): 93-128; (3): 223-46; (4): 355-65. Davis, M. B. 1980. Quaternary History and the Stability of Forest Communities. In Forest Succession, edited by D. C. West, H. H. Shugart, and D. B. Botkin, 132-53. New York: Springer-Verlag. Gilluly, J., A. C. Waters, and A. O. Woodford. 1975. Principles of Geology. 4th ed. San Francisco: W. H. Freeman. Gleason, H. A. 1926. The Individualistic Concept of the Plant Association. Bulletin of the Torrey Botanical Club 53:7-26. Goodlett, J. C. 1954. Vegetation Adjacent to the Border of the Wisconsin Drift in Potter County Pennsylvania. Harvard Forest Bulletin No. 25. Hack, J. T. 1960. Interpretation of Erosional Topography in Humid Temperate Regions. Amer. Journ. Sci. 258A:80-97. Hack, J. T., and J. C. Goodlett. 1960. Geomorphology and Forest Ecology of a Mountain Region on the Central Appalachians. U.S. Geol. Survey Prof. Paper 347. Washington, D.C.: USGPO. Leopold, L. B., M. G. Wolman, and J. P. Miller. 1964. Fluvial Processes in Geomorphology. San Francisco: W. H. Freeman. Matthes, F. E. 1950. The Incomparable Valley. Berkeley: University of California Press. Olson, J. S. 1958. Rates of Succession and Soil Changes on Southern Lake Michigan Sand Dunes. Botanical Gazette 119 (3): 125-70. Preston, F. W. 1962. The Canonical Distribution of Commonness and Rarity. Part I. Ecology 43:185-215, 431-32. Prince, R. J. 1973. Glacial and Fluvioglacial Landforms. New York: Hafner. Sigafoos, R. S., and E. L. Hendricks. 1969. The Time Interval between Stabilization of Alpine Glacial Deposits and Establishment of Tree Seedlings. U.S. Geol. Survey Prof. Paper 650-B. Washington, D.C.: USGPO. The result of a lifetime in the field and in the classroom, Chance and Change challenges many of the tenets of establishment ecology. 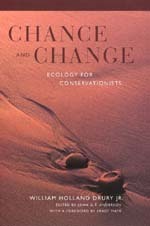 Charging that most of the environmental movement has ignored or rejected the changes in thinking that have infiltrated ecological theory since the mid 70s, William Drury presents a convincing case that disorder is what makes the natural world work, and that clinging to romantic notions of nature's grand design only saps the strength of the conservation movement. Drury's training in botany, geology, and zoology as well as his life-long devotion to work in the field gave him a depth and range of knowledge that few ecologists possess. This book opens our eyes to a new way of looking at the environment and forces us to think more deeply about nature and our role in it. Chance and Change is intended for the serious amateur naturalist or professional conservationist. Drury argues that chance and change are the rule, that the future is as unpredictable to other organisms as it is to us, and that natural disturbance is too frequent for equilibrium models to be useful. He stresses the centrality of natural selection in explaining the meaning of biology and insists the book and the laboratory must be checked at all times against the real world. Written in an easy, personal style, Drury's narrative comes alive with the landscape—the salt marshes, dunes, seashores, and forests—that he believed served as the best classroom. His novel approach of correlating landscape evolution with ecological principles offers a welcome corrective to discordance between what we observe in nature and what theory tells us we should see. William Holland Drury Jr. (1921-1992) was Professor of Biology at the College of the Atlantic, Bar Harbor, Maine. John G.T. Anderson is Professor of Biology at the College of the Atlantic.